UK Face Fit Testing Legislation is now nearly five years old. All UK employees who wear tight-fitting respiratory protective equipment (RPE) should, by now, have a certificate to prove that the protective equipment they wear during work not only fits them, but also affords them the effective protection necessary for the task being performed. However, research indicates that this is not the case. Expanding upon the European Directive 98/24/EC of April 1998 1 , the UK Health and Safety Executive (HSE) updated the Controls Of Substances Hazardous to Health (COSHH) regulations in November 2002 and included the requirement that any RPE supplied by the employer is Fit Tested with the wearer. This is to ensure that the RPE is not only suitable for the conditions in which it is being used, but that, by fitting the wearer correctly, it provides effective protection. In the UK, respiratory-related diseases and conditions account for the third-largest work-related illness. Those affected include metal plate workers, vehicle body builders, plumbers, gas fitters, carpenters and bakers. In 2006/07 a survey of self-reported illnesses indicated that there were around 142,000 people with “breathing or lung problems” which they believed to be work-related. Because faces are of all shapes and sizes, they need to be carefully matched to the most appropriate make/model of RPE. Faces also change with time and this can have a significantly adverse effect on the effectiveness of a tight-fitting facemask. Effectiveness depends on there being a good contact between the wearer and the mask - and the contact can only be assessed by performing a Face Fit Test. There are two types of Face Fit Testing - Quantitative and Qualitative. A contentious area of the Fit Test is the requirement that all persons must be clean-shaven within the area of the face/mask seal. Research carried out by Health & Safety Laboratories in the UK shows that facial hair - even stubble - can adversely affect the fit of a mask to the extent that it is difficult to ensure that it fits correctly and thus provides effective protection. During Fit Testing, a series of short exercises are performed to simulate the wearer’s movements during a normal working day. This allows the mask/face seal to be assessed under realistic conditions. Any other Personal Protective Equipment (PPE) that is worn, in conjunction with the RPE, during the working day must also be worn during the test. This is to ensure that safety helmets, safety spectacles/visors, ear defenders etc. do not interfere with the correct wearing of the mask. Face Fit Testing should not be confused with a Fit Check - which should be carried out whenever donning a tight-fitting facemask. The Fit Test is to ensure that the device will fit the individual correctly when donned and worn in accordance with the manufacturer’s instructions. The wearer should carry out a Fit Check, each time he or she dons their facemask, to ensure that it is being worn correctly. The Fit Check should only be carried out on a make/model/size of facemask for which the wearer has already completed and passed an appropriate Fit Test. In the US, yearly re-testing is mandatory and in Canada it is mandatory on a bi-yearly basis. Under present UK legislation, re-testing of personnel is required only when significant changes to the face have occurred (e.g. scaring, moles, extensive dental work, extreme weight loss/gain) or if the size, make or model of the required RPE changes. However, data presented by the HSE 3 suggests that re-testing should be performed in the UK more frequently. It is therefore likely that Face Fit Testing will become an increasingly important issue. Findings from a recent national survey of respirator programmes, published by the National Institute for Occupational Safety and Health (NIOSH) and the Bureau of Labor Statistics in the US, revealed some worrying issues. The survey questionnaire targeted 40,000 private sector organisations where RPE use was mandatory. The questionnaire contained 37 questions. A request was made that the person most knowledgeable about the use of RPE within the establishment completed the questionnaire. Of the 37 questions, six applied to both voluntary and mandatory use of RPE. The other 31 questions referred to mandatory RPE use. Three of the questions related specifically to Face Fit Testing of tight-fitting RPE. The most fundamental issue was that a large number of establishments using tight-fitting RPE did not conduct any Fit Testing. This clearly indicates a need to improve the awareness, understanding and implementation of a respirator programme in general - and Fit Testing in particular. A similar survey of over 5,000 Health and Safety representatives was carried out in the UK during 2004. Approximately 90% of the respondents had not previously heard of Face Fit Testing, and of these over 10% remained unconvinced that it either applied to them or was relevant to their activities. This highlights the concern that Face Fit Testing is not being carried out in accordance with national legislation and European guidance. It also confirms the requirement for a greater awareness of the need for comprehensive Respiratory Protection Programmes in the UK. Any person performing the testing must be a ‘Competent Person’ as per the minimum requirements detailed by the HSE in their Operational Circular OC282/28. The testing must be documented and records kept for at least five years. 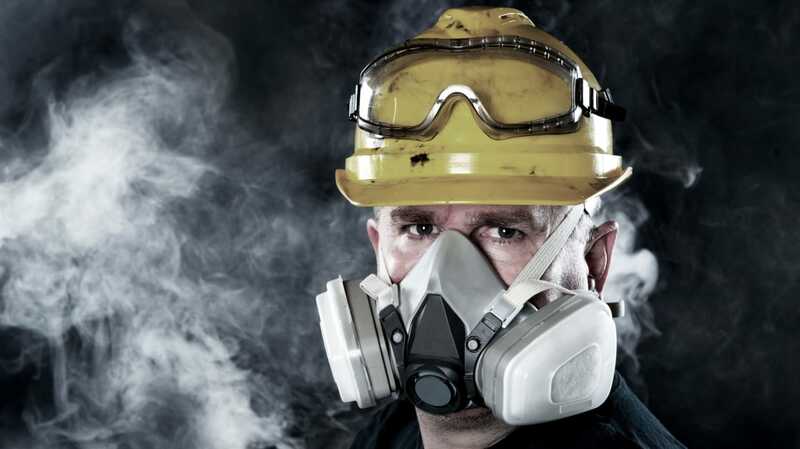 Approved Codes of Practice (ACoPs) and HSE Operational Circular 282/28 ‘Fit Testing of Respiratory Protective Equipment Facepieces’ have been issued outlining the options for compliance and recommending how Face Fit Testing should be performed. ACoPs have ‘special’ legal status within the UK in that, if a prosecution takes place and it is proved that these recommendations were not followed, it would then need to be proven by the employer that compliance with the COSHH requirements had been achieved in some other way. Recent discussions with the HSE indicate that the OC 282/28 may be upgraded to an AcoP - giving it the same legal status as the current COSHH ACoPs. The requirement for Face Fit Testing is also covered in the Control of Asbestos at Work Regulations (2002) and the Control of Lead at Work Regulations (2002). In July 2005, a European Standard was approved by the Comité Européen de Normalisation (CEN) which supersedes CR 529:1993. This requires that all member countries must introduce the European Standard as a national standard without amendment. In the UK it is known as BS EN 529:2005 Respiratory protective devices - Recommendations for selection, use, care and maintenance - Guidance document’. Introduction of this standard into CEN Member Countries was required by March 2006. It provides guidance on establishing and implementing a suitable respiratory protective device programme to provide a European-wide baseline for the selection, use, care and maintenance of respiratory protective devices. It is not intended to be exhaustive, but highlights important aspects to which attention should be given. These recommendations will help organisations comply with the national legislation of CEN Member Countries - where such legislation exists - or with European Legislation. It appears that there are still many employers who are not compliant with the current legislation. Since the introduction of the legislation in the UK, a number of companies have been served Improvement Notices by the HSE. This requires them to implement a RPE Fit Testing programme for all employees that wear tight-fitting RPE. Although having such a programme in place may indicate to the HSE an employer’s ‘intention to comply’ it does not necessarily protect the employer from retrospective prosecution. With the number of compensation claims increasing, employers who do nothing are increasing the risk of legal action being taken against them by both current and ex-employees. The potential for retrospective litigation is considerable - and without clear evidence that employees were tested for the fit of their RPE, claims may become increasingly difficult to defend against. One shipbuilding company had to pay out an average of £17,000 per employee with a further £15m being set aside for future claims5 due to insufficient RPE protection/testing during asbestos removal operations. It is probably only a matter of time before similar judgments affect chemical and other process industries. National Legislation in CEN Member Countries - and European and National Guidance documents - outline the requirement for organisations to implement a complete RPE Programme that covers the correct selection, use, care and maintenance of suitable and adequate RPE where there is a respiratory risk to the health of workers due to their activities. This includes the requirement to carry out Face Fit Testing for tight-fitting RPE and to introduce a clean-shaven policy where applicable. Clearly, there is a need for individuals to be trained correctly in the use and maintenance of any device with which they are provided - and for employers and health professionals to fully understand all the risks associated with poorly selected, incorrectly fitting, RPE.